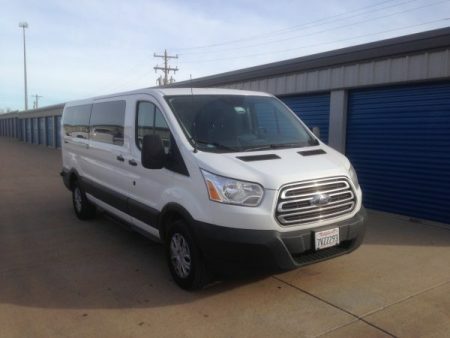 Day 2 and we’ve already racked up some serious miles in the Septura battle bus. So far we’ve resisted the urge to stencil the group’s logo onto the side of the vehicle, and the only thing we’ve knocked over has been a very unfortunate traffic cone on the Interstate. We woke up this morning in Stillwater, Oklahoma, well rested & refreshed from our stay in the beautiful Atherton Hotel on the Oklahoma State University campus. The hospitality extended to us at OSU was genuinely extraordinary. We said our goodbyes to my very good friends Paul & Lanette Compton and then piled into the van. 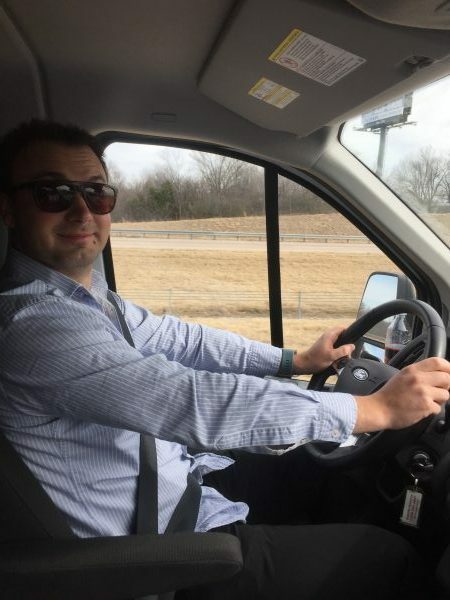 The other lads are starting to become acquainted with the Interstate freeway that dissects the continental USA, I35. We’ll be traveling hundreds of miles on this stretch of tarmac that spans from the US/Mexico border in the south all the way to Lake Superior in the north. 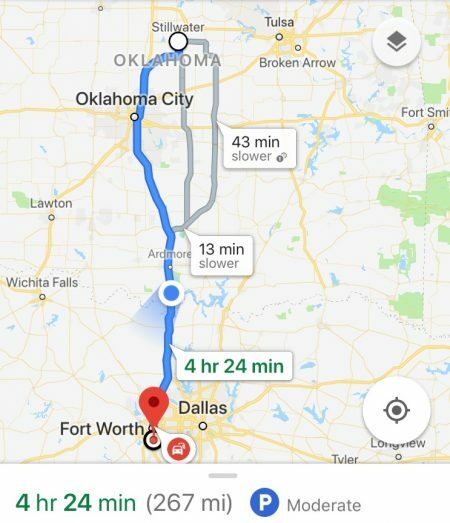 Today we spent about 4 hours on I35, finally reaching Fort Worth in time for our rehearsal ahead of the concert at Texas Wesleyan University. 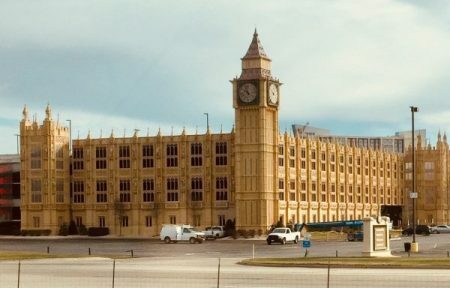 The Texan border welcomed us with the sight of a familiar London landmark, which happens to adorn the front of a casino. In many ways this USA road trip is a trip down memory lane for me. I spent a few years in Texas, earning my Bachelors degree from the University of North Texas – a campus which is clearly visible from I35. I’ll spare our loyal readers the nostalgia trip of a nearly middle-aged bass trombonist, but I have to mention how nice it has been to catch up with friends who I haven’t seen since I finished my degree and moved to London in 2005. Fort Worth Symphony Orchestra bass trombonist Dennis Bubert taught me for a year at UNT, and I was excited (if not slightly nervous) to see him in attendance at our Texas Wesleyan University concert. 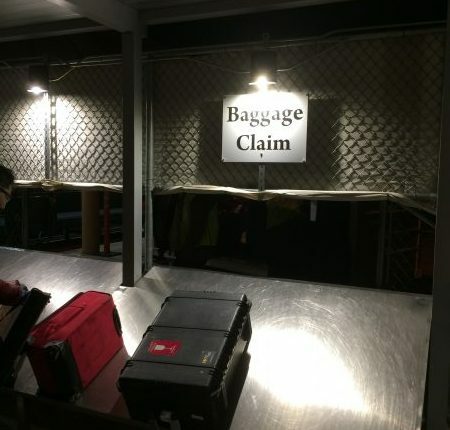 Once again our hosts exhibited the friendly hospitality that is typical in this part of the world. After setting up in Martin Hall we were ready for our second concert of the Ravel/Debussy/Gershwin programme which we’ve debuted on this tour. The hall offered us a rich acoustic which especially suited the French music in the first half. The all-Gershwin 2nd half seems to get toes tapping and Coxy’s performance on the car horn was especially superlative. We were rewarded for our efforts with another standing ovation and a record number of CDs sold in the interval. Celebrations ensued at, what is in my opinion, the finest drinking establishment in Fort Worth: the Flying Saucer. Our friends David Begnoche (trombone professor –Texas Christian University) and Michael Martin (trumpet – Boston Symphony Orchestra) joined us and my college buddies for a couple of jars (and evermore chicken wings). 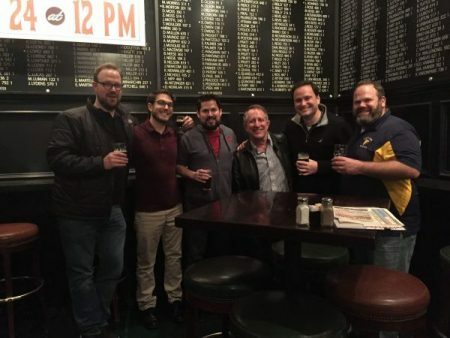 Hundreds of beers are featured on the menu at the Flying Saucer, and we managed to sample a few before the sensible members of the group retired to recharge batteries ahead of the long voyage in the morning. Tomorrow we’re retracing our steps and heading north on I35, bypassing Oklahoma on the way to our 3rd concert of the tour, this time in Manhattan, Kansas. It should take about 7 hours, and I’ve baggsied the right to sleep for the first driving shift, having enthusiastically reminisced about the Good Ol’ Days with my Texan friends until the whee hours of the morning. Old Friends – left to right: Dan, Cory, Stephen, Dennis, Trevor and Jonathan… all trombonists! Our debut USA tour opened at Oklahoma State University (OSU), home of the Cowboys (Go Pokes!). The group met up in Dallas Fort Worth Airport, with Matt Knight and I having flown down from San Francisco on the back of a 3-week tour with the Royal Philharmonic Orchestra. 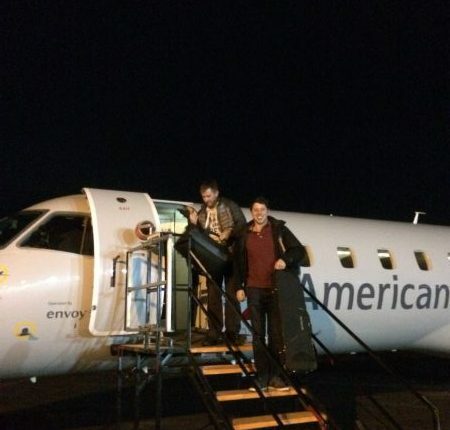 We squeezed onto a tiny plane bound for Stillwater, Oklahoma: getting the tuba on board shocked a few of the locals, but where there’s a will there’s a way, and 40 minutes later we were disembarking into the smallest arrivals ‘lounge’ I’ve ever seen. Our wonderful hosts for the first concert, Paul and Lanette Compton, met us at the airport and transferred us to the Atherton Hotel, OSU’s flagship hotel – comfy beds, great bar and restaurant. We were well looked after. By this point Huw – flying from Switzerland to the USA – had been up for twenty-seven hours, so it was high time for some kip. Jet-lag dealt with, the next morning was spent at leisure, with a surprising number of people hitting the gym, before rehearsal started at 3pm. 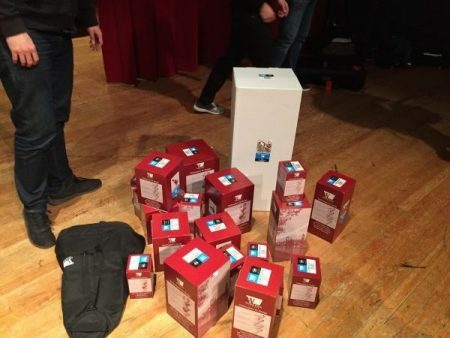 On arrival we picked up a large shipment of mutes courtesy of Denis Wick USA who have very kindly provided them for the tour (if you’ve ever been to one of our concerts you’ll know that we use a lot of mutes). 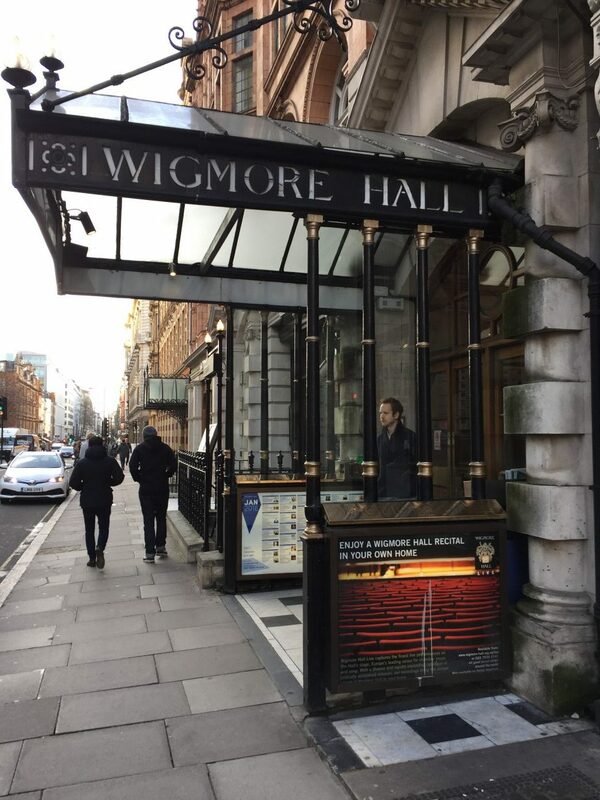 As yet, the second half of this programme – Gershwin Preludes, Songbook and An American in Paris – had never been performed, apart from an informal run-through for our Friends and Supporters at the Wigmore Hall earlier in the month. There were a number of corners which required attention, including the first outing for Simon doubling on taxi-horn – which, being so loud, is going to assist in getting any late, lazy members out of their slumber in the mornings. The standing ovation reflected on a concert which went down extremely well, attended by people from Oklahoma City and as far as Texas. A strong cohort of students were keen to take pictures and chat with us post-concert, and as well as the usual brass chat, we discussed the building of OSU’s fantastic new performance centre and the possibility of us returning in a couple of years. The evening was rounded off in true American style in Buffalo Wild Wings, with most of us ordering chicken wings which were both too hot and too large for our appetite. When we’d finished sweating we headed to bed. Tomorrow we pick up our tour bus and begin our road-trip in earnest, as we travel to our second concert at Texas Wesleyan University in Fort Worth. We’re looking forward to our first US tour in just a few weeks’ time. All of the info about where we’re going can be found on this page – it’s going to be quite a busy couple of weeks, with 10 concerts in 10 days in 8 different states. We’re playing a brand new programme called “American in Paris”, which explores a great transatlantic relationship – between Ravel and Gershwin. We’re very grateful to the Royal Academy of Music and Denis Wick London for supporting this tour. Our first rehearsal of 2018 took place this week, polishing up the new arrangements for the tour. 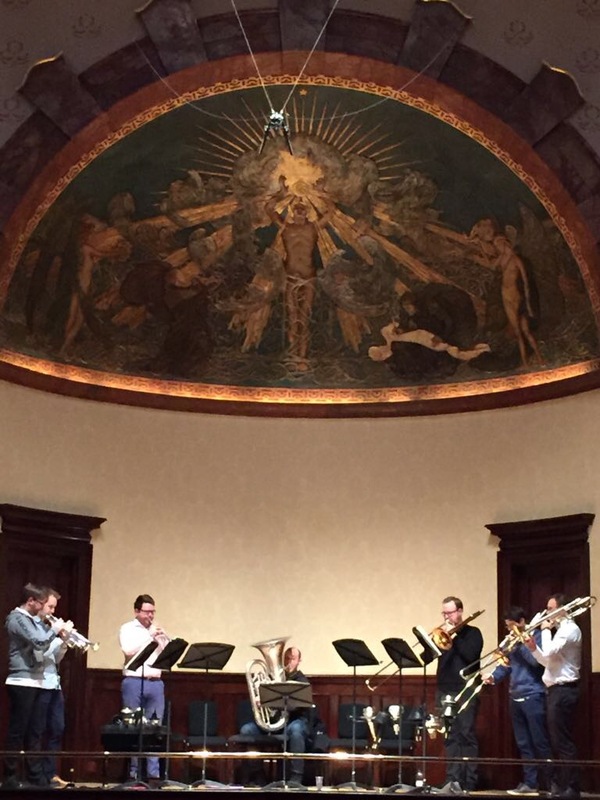 Perhaps the best rehearsal venue we’ve ever had – London’s Wigmore Hall. Septura are delighted to have signed with forward-thinking music management partnership Ikon Arts-Edition Peters for general management. Ikon boast an enviable roster of artists, with a particular specialism in vocal and chamber groups, and so are perfectly placed to help Septura in the next stage of the group’s development. Ikon have the expertise and vision to take Septura to the next level as we continue on our artistic journey, bringing our unique approach to brass chamber music to more and more people, both in the UK and internationally. We are really looking forward to working with the whole team at Ikon, especially Hannah Marsden who will manage Septura. Music for Brass Septet 5 – Fauré, Debussy and Ravel – is released today! Our latest recording has been quite a long time coming – we actually recorded it 2 years ago in November 2015. Hopefully you’ll think it’s worth the wait – we certainly enjoyed recording it, and this music has proved to be a fantastic addition to our concert repertoire over the past two years. Our recordings generally focus on a specific period and group of composers, and this allows us to spend lot of time really getting into a particular style. The incredible music on this disc presented some challenges: lots of it is piano music, which is always tricky. 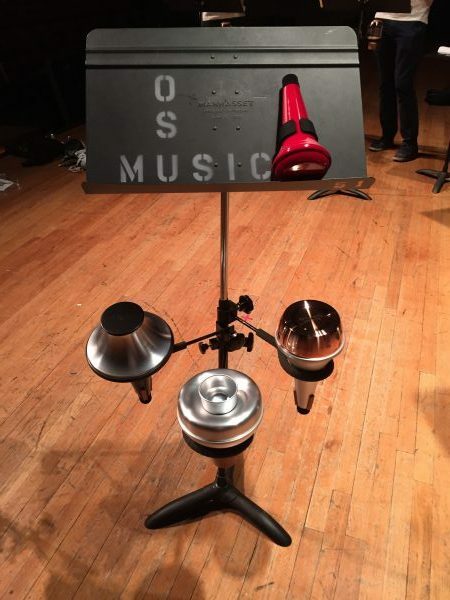 The effect of the sustain pedal is a very difficult thing to imitate on other instruments. Perhaps more significantly though, we have to reproduce the work of a single pianist using seven individual musicians. This means that it is incredibly important that we’re all exactly of one mind musically, especially in music like this that requires a lot of rubato – the ebb and flow that a pianist would naturally give to the music. We have to take great care in the arrangements and in rehearsal to make sure that we have a united musical intention. Luckily Septura’s members have honed their chamber music skills – the most important of which is listening – over many years, and so progress is always pretty speedy. Septura’s players are also all active as soloists, and so it was great to be able to feature a lot of them on this disc as soloists in various Fauré songs. We believe that brass instruments are fundamentally vocal in nature, and so these mélodies seemed to be a natural fit. Even so, it’s a great challenge to pull off convincing renditions of some of Fauré’s best-known songs. Although we’ve stripped the originals of their texts, our aim is always to retain all of the nuance and colour, and most importantly to capture the musical essence. This recording was made possible thanks to funding from the Rayne Trust, and supported by B&S as part of Buffet Crampon. 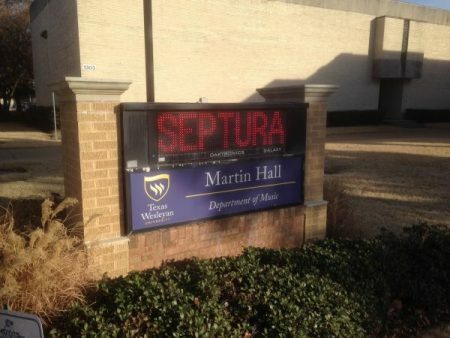 I’m delighted to be joining Septura. I’ve been listening regularly to the group’s recordings over the last few years, and their artistic approach really appeals to me – here’s to plenty of exciting concerts! We’ve just finished recording a new disc for Naxos (our 7th). This latest one is the longest we’ve ever undertaken, and also probably technically the hardest. But the music holds a special place in our hearts because it brings us on to home turf. Our recordings so far have taken us to Germany and Austria, Russia, Italy, and France. But this one is decidedly British: Elgar, Parry, Finzi and Walton. The process actually began about a year ago. We’d just finished recording Christmas with Septura, and so were looking to the next volume. Our series is broadly planned out (we can tell you roughly what we want to play on volume 25! ), so we knew that we wanted to pay a visit to 20th-century England. But the particular composers and the specific pieces were agreed only in the autumn of 2016, after a summer of very English listening. Early on we decided that we’d stolen enough choral and keyboard works for the time being, and it was time to plough another particularly fertile furrow: music for strings. Elgar’s beloved Serenade, Finzi’s Prelude and Romance, and Walton’s Sonata all fitted the bill, and most importantly we could immediately hear them as pieces for brass. Ultimately though we couldn’t resist including some masterpieces from the rich English choral tradition: Finzi’s rousing anthem “God is gone up” is such a natural fit for brass (“The Lord with sounding trumpets’ melodies”); and the first four of Parry’s Songs of Farewell have long been an ambition for the group. Repertoire set, there was the small issue of divvying it up and actually arranging it, as well as getting permission for the works in copyright. I bagsied the Elgar and Parry, which was lucky because Simon was keen to do the Walton – he had first heard it 10 years beforehand at La Mortella, the composer’s home in the Bay of Naples. With a deadline of mid-May, we set to work. After comparing notes, incorporating a few suggestions, and pinching some ideas from our Royal Academy students, the scores were ready just a week before the first read-through in June. The first read-through is always a slightly dispiriting experience. Having spent months immersed in this music, imagining every detail of its glorious reincarnation for brass, it’s slightly worrying when – despite the unparalleled sight-reading of Septura’s members – it doesn’t quite sound as you’d expected. Simon’s Walton in particular is very hard – totally un-sight-readable. “Will it be ok? Have we bitten off more than we can chew this time?”, I ask nervously. “Relax, it’ll be fine – it’s always like this the first day”, Simon reassures me. Sure enough, when we meet again a couple of weeks later, after a bit of frantic private practice (not least for me), everything comes together. We hone our new versions over the next few weeks – aided by performing the Elgar at the Gregynog Festival in Wales – and then we’re ready for the red light of the recording studio. The recording itself is always very intense – we do two three-hour sessions a day, three days in a row. Normally we aim to get 20 minutes of music a day (and just about manage) but because of the length of this disc we needed 23. We felt better prepared than ever before though, and, in the familiar surroundings of St Paul’s New Southgate, we sailed through the Elgar on the first day, with our Producers Phil Rowlands and Jim Unwin expertly guiding us through the musical rigours of recording. Day 2 was the big one: the Walton. And for the first time in our recording history disaster struck. Its form: an oil leak, leaving Alan stranded at the side of the M40 as the session was due to start. A two-and-a-half hour delay put us on the back foot, but the group rallied and we ended the day weary at 11.15 pm, but relieved to have the Walton in the can. The final day is always a bit of a challenge – tired faces plus time pressure make for an intense race to the finish. This time the Finzi and Parry were actually fairly straightforward, and we made it to our favoured watering hole, The Charles Lamb, in plenty of time for last orders. Now Phil and Jim have the unenviable task of piecing the takes together. Meanwhile Simon and I are planning disc number 8 – so watch this space!